Acclaimed actor Michael Chiklis dishes on his time working for Ryan Murphy in 'American Horror Story: Freak Show,' and also reveals why he has limited interest in returning to the popular FX series. Larry King: Switching gears, the last time you were on when you did one season on the hit series ‘American Horror Story.’ Are you going to go back? Do you want to do it again? Michael Chiklis: Probably not. I mean, that was one of the darkest years of my career. It was, I think, it’s one thing to do a horror film in the context of like two months or something like that, but to live in that for six months it just became, I don’t know. Maybe it’s because I’m an empathetic person, and I just sometimes start to take things on. But it was so dark, and it was so nasty. Larry King: What about Ryan Murphy, you like working with him? Michael Chiklis: Oh he’s terrific. I mean, I’ve known Ryan for a long time. Larry King: He likes to bring his actors back. Larry King: You weren’t happy doing it? 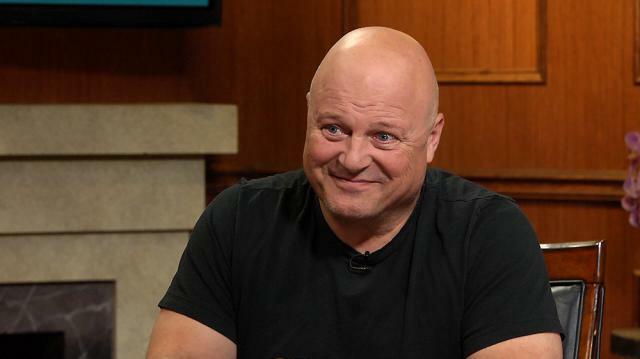 Michael Chiklis: It wasn’t about that, I love the cast, I had a great time with everyone. And some of the greatest women in the acting world on that show, and I love them all. I really did. But it was such a, you know, such a dark place to go to everyday. Larry King: Really, even just, acting is acting – isn’t it? Michael Chiklis: Yeah it is and I’m usually able to shed things pretty easily. I mean I played Vic Mackey and that was very dark. And I was able to somehow just shake that off and walk away from it. But in the case of ‘American Horror Story’ I had a harder time with it. It was just so dark. It was just, whoo, I always felt like, creeped out. Larry King: Did you watch the finished product? Michael Chiklis: No. I have to tell you, the first time in my career I watched the first few and then I just was like, I don’t know why, I just didn’t want to go on. Larry King: Did you discuss it with the director? Did you tell him about your feelings? Michael Chiklis: Yeah, I went and did my job, you know? To the best of my ability. And I did everything that I could to represent what was supposed to be represented. But I… it didn’t mean I needed to live in it.